A recap of the 2018 Workplace Week New York event. The concept of the “employee experience” has dominated the workplace design and management agenda over the last year or so. In June, Workplace Week New York (WWNY), a philanthropic event that raised thousands of dollars for the “I Have A Dream” Foundation in New York, questioned the art and the science behind the discourse in order to guide design teams moving forward to create work environments that benefit their inhabitants and facilitate their happiness and wellbeing alongside productivity. Abrams Books, one of the sites that opened its doors for Workplace Week New York, retained architectural and design firm Spacesmith for the site selection and design of its new 40,000-square-foot headquarters. The design concept was driven by a desire to support and boost collaboration. There are few organizations, if any, that would claim to have reached peak efficiency with their office environments. In fact, this would be a troubling claim in the data age where tech is infiltrating almost every aspect of life. Thanks in part to the plethora of smart-enabled gadgets that are fast becoming commonplace in corporate real estate, there’s now serious momentum behind viewing the workplace as a vehicle for business transformation, as the creator of Advanced Workplace Associates’ (AWA) Workplace Week Andrew Mawson suggests. Smart sensors are gathering data about how we use space that significantly supports the creation of built-for-purpose workplaces that boost productivity, encourage positive behaviors and foster an overall sense of wellbeing. 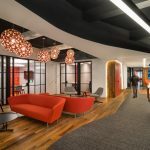 During WWNY, workplaces across New York City, many of which had embarked on redesigns or relocations, opened their doors and showed how people-centric, forward-thinking approaches had transformed offices, optimized employee experiences and improved wellbeing and performance. With over twenty internationally recognized brands in the line-up, including DELOS, Nickelodeon, IPG Mediabrands and Structure Tone, it’s clear how some of these big-league players are using their real estate to attract and retain the industry’s top talent. The key is to create environments that expertly support staff to perform to their best ability. The topography of any space defines how people interact with and negotiate it. Wayfinding, the human instinct to navigate an environment, is a tool that designers can use to create spaces that encourage new behaviors. AWA’s team of change management specialists believe the moment of relocation provides a business with the prime opportunity to implement strategic changes, but these measures go a lot deeper than a new address on the company stationary. If the objective is to re-energize the workplace through strategic and behavioral change, the existing environment should be looked at from every possible angle, beginning with the layout. Standing in the heart of New York City’s Meatpacking District, the Delos Living LLC headquarters illustrates how designers can encourage physical activity and reduce the negative effects of sedentary working by incorporating varied topography in the space. Punctuating the space with distinct features such as a living wall can improve air quality and provide a connection to nature. Mawson suggests the debate over open plan or cellular office layout is ill-focussed. For him, the main question is, ‘what environments do we need to allow people be the best they can be?’ Mawson argues there’s a short-sightedness attached to designing within the binary of these layouts and instead suggests design teams embrace activity-based working styles. They offer a hybrid layout that serves to liberate people from the confines of segregated cubicles and provides them with collaborative and social environments for the sharing of ideas while providing other quiet spaces too, for information processing and concentration. Perhaps the increasing popularity of agile work environments is in response to the realization that outside of work we choose to be in spaces that support our needs and we often move from one place to another depending on what we’re doing. Considering we spend a third of our lives at work, it’s natural to need a variety of spaces within the workplace too. People are still living while at work, so our human nature should not be neglected in the office design. Many of the tours showcased how transparency had been woven into the fabric of the office layout. Break-out spaces are being designed as focal points where colleagues gather and socialize or hold quick informal meetings. Common areas, often referred to as ‘town halls’ or work bank ‘neighborhoods’ allow colleagues to feel part of something and experience their workplace with a sense that they truly ‘belong’ there. Taking this a step further, many relocations feature glass partitioning ensuring that operations are conducted in plain sight, and that everyone including the executive team is accessible. Designed by Gensler, Structure Tone’s 82,000-square-foot office space incorporates innovative wellness features and designs to make the space more collaborative. Common areas are vital for social cohesion and information sharing. We are a nomadic species, known to have travelled and established communities for brief periods before moving on. A notable trend of the modern workplace in many of the Workplace Week HQs is the abandonment of assigned seating in favor of occupying a range of activity-based spaces throughout the working day. This encourages behavioral changes that benefit the employee experience. It might be easy to sit in a single location throughout the day, however, the dangers of sedentary work are now widely acknowledged so encouraging movement to new activity-specific setups contributes to general health and wellbeing. A lack of designated space is not a sign that individuality has been stripped away in the modern workplace. Artwork and photography provide engaging backdrops that help to mark specific zones. Often, these areas embody distinct themes and use color referencing, such as bold graffiti or bright yellow as a subtle nod to New York City’ cabs. Other zones feature natural green hues punctuated by biophilia to create a tranquil habitat that connects people with nature. What you’ll see less of is strict company branding lining every surface. There is now a shift toward capturing the company culture and expressing it through the design of the workplace through color palettes, furniture and textiles that speak to the users of the space rather than shouting a corporate motto at them. The design of workplace environments is now about applying more consideration to the impact that space, materials and natural light can have on stress levels and cognition. Providing access to an enhanced circadian lighting experience, flora, and fresh air isn’t considered the cherry on top, it’s quickly becoming recognized as part of a list of fundamental considerations that will contribute to an overall increase in employee satisfaction. Delos Living’s garden oasis takes good air quality to another level, providing an outdoor haven with access to living plants, natural light and open air. By its nature, design as a discipline is fundamentally rooted in change, with a goal to streamline and drive progress. And that’s why Workplace Week NY will return next June – to showcase workplace innovation in order to inspire change. Designing without improvement is like creating a four-legged table but only supplying three legs. With one leg missing, the table may stand but will be unstable, and under pressure, it is almost certainly going to collapse. By applying smarter design, that uses the gained knowledge and tools of the past decade, designers can shift the essential structure of the table in such a way that it remains a lean, cost-effective asset and stands stronger under pressure.